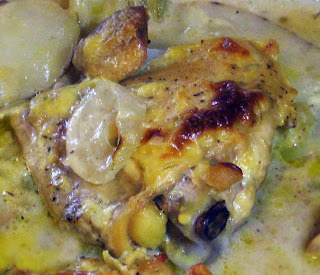 Made with Breakstones new jalapeño flavored sour cream this creamy chicken and potato recipe was darn delicious. The recipe evolved as a result of hosting a Breakstones Sour Cream House Party. Ready in just over an hour, busy moms will find this quick and easy chicken recipe a suitable and tasty weekday meal choice. I recall very much appreciating one dish meals when my boys were young. Preheat the oven to 375. Arrange potato slices in a 9 x 11 baking dish. Cover with half of the onion slices. Wash chicken thighs and pat dry. 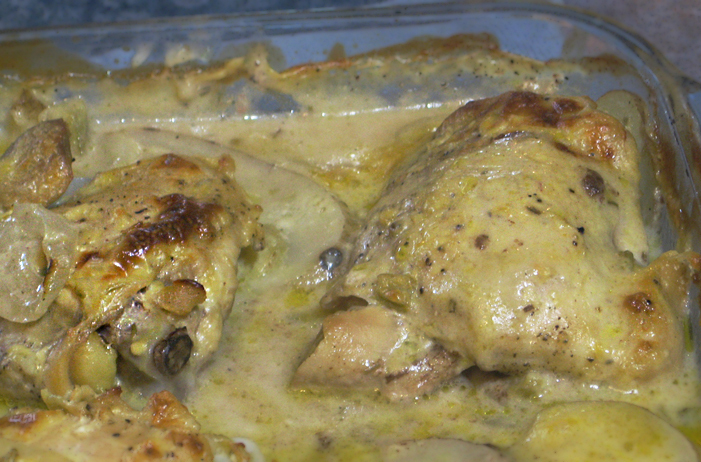 Sprinkle chicken with salt and pepper and add to the baking dish. Sprinkle the rosemary over the chicken and potatoes. In a small bowl, combine the soup and milk, mixing until completely blended. Stir in the sour cream and mix well. Pour the soup mixture over the chicken and potatoes. Bake for about one hour or until potatoes are soft and chicken juices are clear. Breakstones flavored sour cream added a rich depth and spicy bite to an otherwise ordinary meal. I served this chicken and potatoes with a fresh garden salad. The recipe as written served three adults however the quantities can easily be doubled to serve a family of four or five.